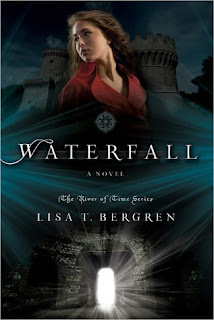 Small blurb from Goodreads.com: In Waterfall, American teenager Gabi Betarrini accidently finds herself in Fourteenth-Century Italy . . . Knights. Swords. Horses. Armor. And Italian hotties. Most American teens want an Italian vacation, but the Betarrini sisters have spent every summer of their lives there with their archaeologist parents. Stuck on yet another hot, dusty dig, they are bored out of their minds... until they place their hands atop handprints in an ancient tomb and find themselves catapulted into the Fourteenth Century and in the middle of a fierce battle between knights bent on killing one another. Teaser from page 156: "'Gabriella,' Marcello whispered, shaking his head. 'I've never known a woman like you. If we had met before....'."